planning – No More Black. So my boot camp ended a few weeks ago, but I’m still sticking to their meal plan and work out schedule as best I can. It’s a lot harder when I don’t have that amazing group of women (and of course my trainer) expecting me at class three times a week. But here are my results. I lost 1 inch in my bust, 2 inches from my hips and 3 inches from my waist. 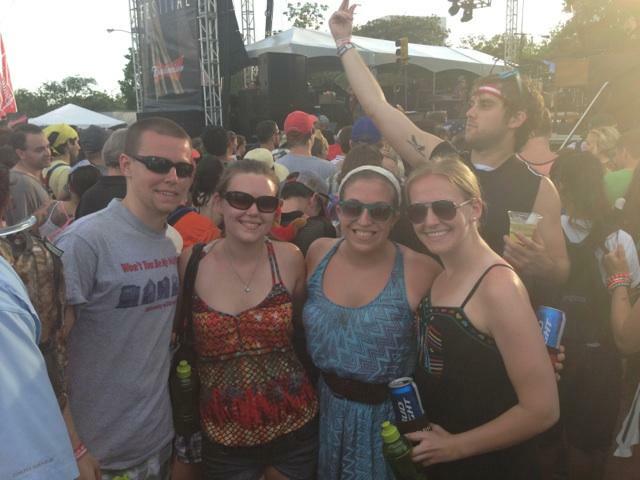 I still feel fantastic (even after the junk-food-fest that was my Memorial Day and then Free Press Summer Fest weekends). I did gain 2 pounds, but I’m convinced that that’s because I gained a ton of muscle over the past 2 months. I feel stronger, more capable and more confident. I no longer look at those fitness challenges on Pinterest and laugh, in fact, this month (June) I am doing a 30 day squat challenge. By the end of the month I will be able to do 250 squats. But you’ll notice I’ve very conspicuously avoided calling these my “Final Results”. I’ve rediscovered my love of working out. I’m going to keep going. And I’m going to be putting my pennies in a jar in the hopes of signing up for boot camp on a recurring basis. Because as much as I hated doing burpees, hill runs and tabatas, I miss the way it made me feel – strong. And if you live in Houston, San Antonio or Dallas, and are looking for a great boot camp experience. I cannot recommend Texas Fit Chicks enough. They are encouraging, supportive and still know how to push you to be your best, all while holding you accountable to your personal goals. 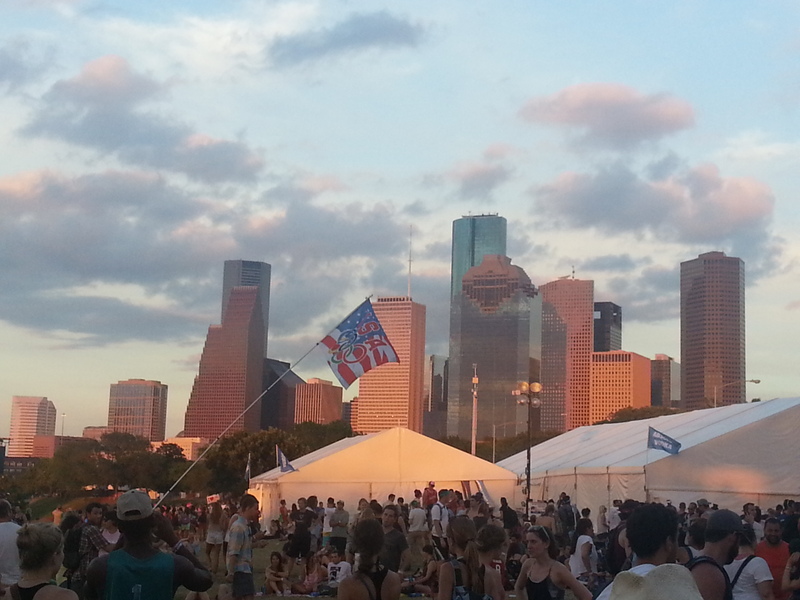 FPSF is held in the shadow of downtown Houston. I can never get enough of this skyline. With Adam’s sister Allison. 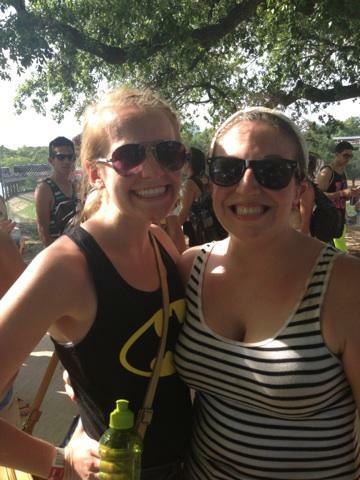 Because sweaty music festival pictures are always in style. 4/5ths of the group on day 2. So after completely, totally, unequivocally recommitting myself to Weight Watchers, I was actually really excited to weigh myself this weekend. Hooray for me! But I can’t let myself get too complacent, because Easter is this weekend and we all know I love my holidays. I’ll be contributing a tasty vegetable side dish to my family’s dinner, and will be sure to post the recipe when I decide what I am going to make. I feel great though, and I’m excited to keep going. I really needed a fresh start and I’m glad I got that this week. I’m going to spend this week keeping focused on tracking, and hopefully I’ll get back out for a run at least once before my family comes into town on Saturday. My big challenge will be the Gaylord Texan Easter Brunch Buffet that waits for me on Sunday. Because I’m still working on that little thing called self control. Goals are great. Especially to those of us looking to improve our lives in multiple areas. I’m going to split these goals up into three sections. Wellness, Professional and Personal goals. Get back on track with WeightWatchers. I’ve gotten out of the habit of tracking my food and calculating my daily points and (most importantly) adhering to those points. I’ve still been eating relatively healthy, but I haven’t had the accountability of the tracking to keep me honest. There have been more cookies and queso runs in my life lately. No more. Back to healthy grains and protein and fiber for me. (Related: I can tell a difference in how I’ve been eating because I don’t feel as good as I used to. I’m tired all the time and my body aches.) It wants the healthy food back in my life. n the weekends if I’m not too busy. This year, I’m going to not only use my crockpot more, but I’m going to make enough food that Adam and I can eat our fill and there will still be leftovers. And then those will feed us during the week or on nights I don’t feel like cooking. ly to hit up Panera on my way home from work. I have gotten better about my choices on where I eat out. I’ll pick Panera or Genghis Grill way before I hit the McDonald’s drive through. Drink more water. I keep hoping that if I write this goal in my blog enough, it will actually happen. Read more. I have a ton of social media, marketing and public relations books on my shelf and in my Kindle. I will read them and make notes on how I can use the ideas in them to help my clients. Attend at least one industry conference. I’m hoping it will be South By Southwest Interactive in March, but the price is pretty steep for that. I would like to go to CERAWeek or OTC this year though. Be intentional. I need to take a step back and really look at how my daily actions and decisions are shaping me. I want to live in a way where you can tell exactly the kind of person I am by how I treat myself and others. Be thankful. I think I get so caught up in my work routine that I sometimes forget to be grateful for my life. I got better at it towards the end of 2012, and I want to continue to focus on all the blessings in my life, rather than the negatives. Travel more. I know that sounds really weird coming from the girl who went to Florida, Ohio, Hawaii and whatnot this year alone, but I want to travel even more. I already have a trip to Ohio planned for February, a trip to Missouri in July and then (maybe?) a trip to Hilton Head for September. I fell into a rut where I traveled in 2012, but I feel like I didn’t have very many adventures. Hawaii is really the big one, and then when I moved, that was an adventure for me, only because I didn’t have control over so many different things. Think more. I’m really good at talking. And sometimes, I’m not really good at thinking about how my words, actions or tone will come across. Save more. I’ll admit it. I am terrible at saving money. While I’m not a shopaholic, I do enjoy a good sale and as stated above, I love to eat out. 2013 is the year to hunker down, tighten my belt if need be, and pay down my debt. (Life of a graduate of a private university). So there you have it! What are your 2013 goals? Don’t worry friends, I didn’t forget about you! There is always room for a picture of my 5 month old kitten cuddling with a tiny stuffed bird. I was named the Chapter President for the University of Dayton Alumni Association in the Dallas-Fort Worth area and then promptly asked to plan a Christmas service event as well as re-engage the entire group online. Booking a trip to Ohio in February. Yes, I know I’m insane. And work. We just signed two new clients (YAY) and I’ve spent every remaining minute writing content strategy for them, which I actually really enjoy doing so it’s okay. If you live in the Dallas area and are free tonight or tomorrow, click the picture for more information on how to get involved in Operation: Social Santa. Don’t get me wrong, I love all the things I’m doing and I’m super passionate about all of this, but it’s simply time consuming and I didn’t want y’all to think I have completely abandoned this blog. I have not. I am still sticking to my WeightWatchers, I just am struggling with finding time to write about it regularly. Things will get better after this week. I hope. I have a few recipes I need to write-up (a couple are zero Points+ recipes, yay!) and I will get back on track with you soon. Until then, stick with me, please? You can only plan so much, right? Planning is awesome. Planning is key. Planning is everything when you’re on Weight Watchers. How do you plan for a night when you don’t know what you’ll be doing? Yesterday was my friend Zach’s birthday, so we went to dinner at Buffalo Wild Wings, where I behaved and ate only 9 wings at 2 points each. I had a beer with dinner, which brought my point total up to 19 for the meal. And then we went back to my other friend Matt’s place for drinks. I went with my usual aiming for a low point version of a gin & tonic. Forgetting I was at a man’s apartment, I started searching for the diet tonic water, or maybe some diet Sprite or diet 7-up. Nothing. I settled for Sierra Mist Natural. (3 points) Mixed with the gin (4 points) it made for a pricey drink as far as my point for the evening went. And then there were birthday cupcakes. I hadn’t allotted enough daily points for my mixed drinks, let alone cupcakes. I ended the night by (shockingly) going over my point total for the day and having to dip into my weekly points. I really was trying to save them for happy hour at my favorite Houston dive, Beaver’s, with my cousin, Erin, where I will be eating this beauty. 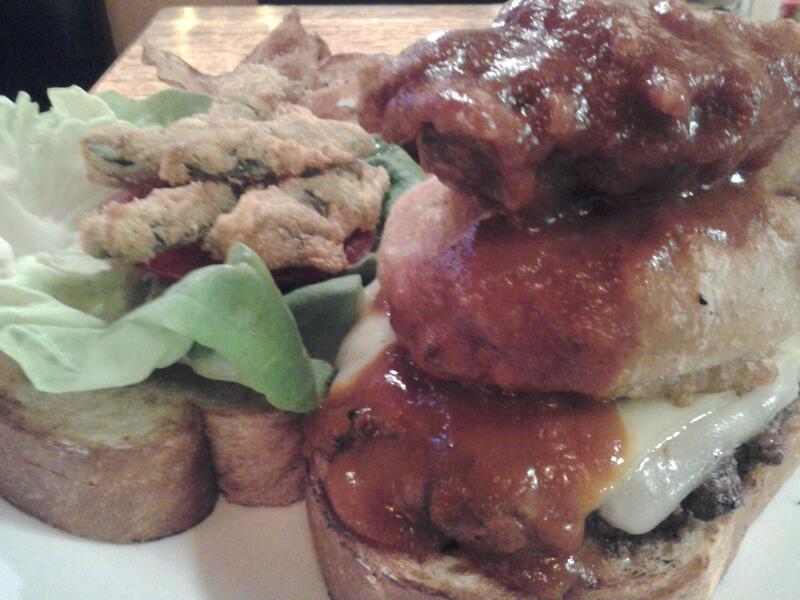 The IceHouse Tillamook Cheeseburger - pickled fried onion rings, cornmeal fried jalapenos, Tillamook pepperjack cheese, and housemade BBQ sauce on Texas toast. This just means I’ll have to be on extra good behavior for the next few days. I’ll be stocking up on Power Foods and working out like crazy. Have you ever had that one night where all your plans and good intentions failed? What did you do?